One month has passed since we welcomed 2019! ●	The Pacific Plate has shifted by approximately 6 millimeters (0.23 inches) around the Hawaiian Islands. How do we know all this? How did we create the technologies that roam space or the knowledge that explains the world within or around us? informed by data published in scientific journals. When you are stuck at the lab bench or have writer’s block, it can be difficult to keep focus or motivation. When somebody asks you, “But how is this relevant?” and your research is the definition of basic, keep this in mind: no matter how small the puzzle piece or how basic the research question–we all are a gear wheel in the knowledge machinery. We do the groundwork that can lead to amazing discoveries, much-needed cures, or world-changing technologies. On the shoulders of giants–very true–but also with the help of many smaller gears. So let’s get to it! The year is young and there are eleven months left for acquiring data that pave the way to new discoveries. As a follow up to last month’s policy and advocacy section, after being shuttered for thirty five days, the United States federal government finally reopened on January 26. However, the NSF, NASA, USDA, FDA, EPA and other government funded science enterprises must still plan for the possibility of another government shutdown beginning on February 16. Thus, while scientists are back to work, long term plans for these agencies are still on hold. For now the focus for each agency is prioritizing which operations need funding in the event of another shutdown. It’s also crucial to note that the government shutdown did cause lasting damage to scientific research. The NSF cancelled grant panels during the last week of January. NASA is delaying the application deadline for its Research Opportunities in Earth and Space until at least 60 days past the government reopening date. The USDA cancelled an interagency conference on invasive species. And, crucially, many scientists working as contractors will not receive back pay for lost wages during the shutdown. If you were affected at all by the government shutdown, please feel free to email me (brian.canter@rutgers.edu). What can we as early career scientists do to mitigate the effects of a government shutdown? Foremost, we can help our colleagues who are affected by political squabbles. Second, we can vote for elected officials who refuse to shutdown the government for a political win. Lastly, we can reach out to our current elected officials with our concerns for how a government shutdown disrupts scientific research. For more information on contacting your elected officials, click here. If you want a particular topic or issue addressed in this section, please feel free to reach out to me via email at brian.canter@rutgers.edu! This month, we stay way up north and go from lovely Canada to another ice-hockey loving country: Sweden! My name is Charlotte. I’m a PhD student at University of Gothenburg, Sweden. I’m a medical physicist with radiobiology as my main area of research. My project focus is to minimize side effects on normal tissue during cancer treatment with peptide receptor radiotherapy. I mainly (so far only) perform pre-clinical studies with both patient-derived xenograft mouse models for neuroendocrine tumors and non-tumor bearing mice. I’m in the beginning of my third year as a PhD student and I finally feel like I am getting a solid grasp on my research field. I remember how confusing it was in the beginning: a physicist entering the world of biology. There was so much I did not understand at first and I lacked basic knowledge about key aspects of the project (cancer, for instance) since I did not have a background in biology. Things can still be a little confusing, but I grew with the challenge and believe it is also the charm of interdisciplinary research. I went to my first RRS meeting in 2017. That was also my first international conference and travel outside of Europe. With so many new impressions and my being so far out of my comfort zone, I was really happy with the warm welcome the new members received. The SIT workshop was very useful to me and it was also a good opportunity to get to know so many other SITs. 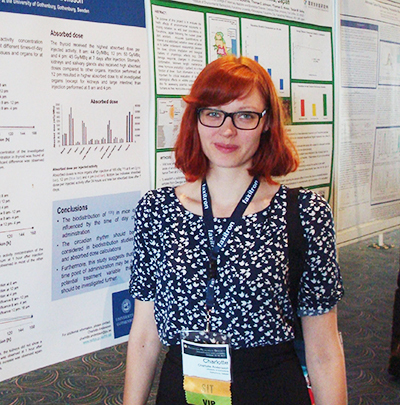 The conference gave me a broader understanding of our research area and I learned a lot. Already looking forward to seeing you all again in San Diego!